I was introduced to Artify by a colleague who enjoys art jamming. She caught my attention when she shared that the public art jamming sessions conducted there are for a social cause. It’s a pay-as-you-wish art jamming sessions at their studio. I wasn’t sure if they could be labelled as a social enterprise but I just thought that their initiative is something that is worth supporting of. In their website, they mentioned that they ‘dedicate 10% of each month’s funds to Drawn by a Nurse‘. Paintings, painted by the nurses, will be auctioned off at the end of the year and all proceeds raised will be donated to TOUCH Community Services, specifically TOUCH Home Care. The recommended amount is $35 per person for each session. And this includes 16″ x 20″ or 16″ x 16 ” Canvas, acrylic paints, brushes, palette and apron. Not to mention that they also provide a free flow of drinks and snacks which I thought it was a pleasant gesture. Anyhow, I decided to join in one of their art jamming session on a Public Holiday. Mind you, the places get taken up really fast! Their studio is located at Textile studio and it was not too difficult finding the place as they provided clear directions on how to get there. I was one of the first few to reach there and upon reaching, the instructors ushered me to an empty seat and mentioned that I could start painting anytime I want. It would be great to look up for an image online before the session just for some inspiration. I went to Google and searched for ‘canvas paintings’. I found a painting which caught my eye and I decided to paint a duplicate of it. The studio is not very spacious but the place is clean. Each station has an easel with the canvas mounted on it, a towel and a bowl of water to wash the paint brushes. The brushes and paint station is near the entrance. So basically, you could use any of the art tools and paints to do your painting. This is my colour palette for that painting. 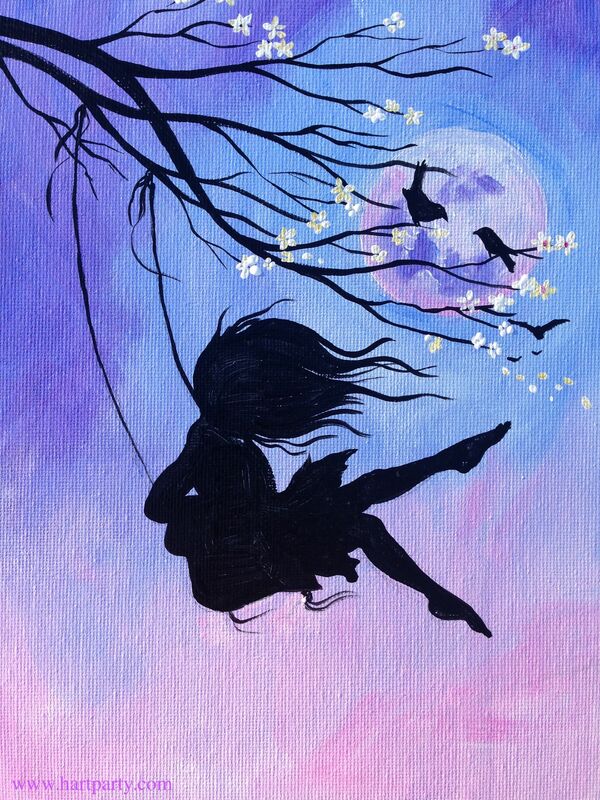 It was quite easy to paint as it is just a silhouette of a girl swinging on a swing against the moonlight. Now, there’s the original image. I took a screen shot of it on my phone so that I could refer to it while painting. As you can see, I didn’t create an exact duplicate of it. I just tried my best to make it look somewhat similar in my own way. Pardon me as I hadn’t had much education on painting. I only learn how to paint properly during my secondary school days which was years ago! While painting, you can always have some tea or snacks while listening to the relaxing background music played in the studio. They also provide hair dryers to blow dry your painting too. At the refreshment bar area, there’s also a mini fridge with cold drinks too. It is indeed a really conducive and nice place to just paint with your loved ones or friends on days where you have the luxury to slow down and have a cuppa. After you’ve completed your painting, you will need to blow dry it with the hair dryer and they would pack your canvas in this huge transparent plastic bag. Just before you leave, slot your cash into their metal cash box. They only accept cash. The recommended amount is $35. They encouraged you to pay based on how much you value the experience. It’s an honour system they practised over here. Support a good cause and be inspired from this art therapy session. To the guy on the street who asked where ‘my painting’ could be bought from, you can contact me via email at u0703890@gmail.com. I will be more than happy to sell off my painting and donate the money to charity.